The Nevada Army National Guard armor-cavalry force has a long and distinguished history. Since the early days of the Nevada Territory, mounted citizen-soldiers have responded to the call of duty. In 1863, the 1st Battalion, Nevada Volunteers Cavalry was formed and mustered into the service of the United States to man the posts deserted due to the Civil War. After statehood in 1864, Nevada Cavalry units were actively engaged in the Indian Wars throughout the West. During the Spanish-American War, Nevada National Guardsmen formed two troops of volunteer cavalry and saw action against the Spanish Army in the Philippine Islands. The 1st Squadron, 221st Cavalry is currently Nevada's only combat arms unit. The squadron was originally organized as the 121st Coast Artillery Battalion. It was ordered into federal service for World War II. The squadron was absorbed into the Regular Army and some of its components saw action in the Pacific, participation in the Ryukyus Campaign. After World War II, the squadron served as Anti-Aircraft Artillery. In the early 1970's, the unit was designated as the 3rd Squadron, 116th Cavalry Regiment. In 1975, the unit became the 3rd Squadron, 163rd Armored Cavalry Regiment. In 1980, the unit was redesigned as the 1st Battalion, 221st Armor. In 1995, the battalion was officially aligned as a round-out to the renowned 11 Armored Cavalry Regiment. In 1997, the National Guard Bureau redesigned the unit as the 1st Squadron, 221st Cavalry. 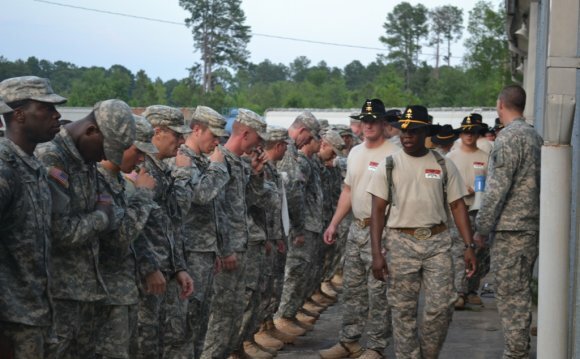 This new designation reflects the Cavalry mission and heritage of the unit. The squadron has been recognized as a premier unit throughout its history. Squadron awards include the prestigious Goodrich Riding Trophy, the Governors Outstanding Unit Award, "Top Gunnery Battalion" of the 40th Infantry Division (mechanized), National Guard Bureau Superior unit award, and the Eisenhower trophy. It is the only National Guard squadron to be certified as Opposing Forces (OPFOR) for the National Training Center (NTC) at Fort Irwin, California. Most recently, the Squadron became the first unit to fight alongside the storied 11th ACR in an active duty NTC rotation. The 1/221 Cavalry earned the coveted "Hamby First Class" award for its victories in the January 1998 NTC rotation 98-04. With the successful completion of NTC rotation 98-10 in August 1998, the Squadron is the first National Guard unit to fight in two active duty NTC rotations in one year. The Squadron is comprised of soldiers from throughout the great state of Nevada. The Headquarters and Headquarters Troop, Troop B, Troop C, and Troop D are located in Las Vegas. Troop A is located in Yerington, and Detachment 1, HHT (Scouts and Morters) is located in Fallon. While the mounts are now M1A1 Abrams tanks, and sabers are only used at ceremonies, the dedication and devotion of Nevada's armor-cavalry soldiers remains "Never Broken." The 1st Squadron, 221st Cavalry entered federal service in support of Operation Enduring Freedom on 15 April 2009. The squadron conducted pre-mobilization training at Camp Atterbury Indiana, and deployed for combat operations on 28 June 2009 to the Islamic republic of Afghanistan. In this mission the squadron provided security force platoons for 11 provincial reconstruction teams in Kunar, Nangahar, Nuristan, Laghman, Khost, Parwan, Paktya, Paktyka, Zabul, Ghazni and Farah. The squadron was also the Coalition Force Provider for the battlespace of Laghman province, a 450, 000 population and 3500 square kilometer province in the north eastern area of Afghanistan. The troopers of the squadron conducted over_8, 000, mounted, Dismounted and air mobile combat patrols, raids and missions. During these combat operations, Soldiers of the Wildhorse were awarded 44 Bronze Stars and 47 Purple Hearts. Upon re-deployment, the squadron will again rejoin the 11th Armored Cavalry Regiment at the National Training Center, Ft Irwin, California and re-assume its role as Reconnaissance Squadron for the Regiment. Wildhorse!! Allons!! When you purchase a car online from a private party or a dealership in another state, it is important to know about how to ship a car. Today, there are numerous auto transport companies that offer you shipment services. As there are nearly no experts in the field because there are no people who use such services on daily basis, you will have to make a little research before choosing the company that is suitable for you. Apart from the price, always consider such factors as experience and reputation of this or that carrier.